Southport School staff & children had a wonderful afternoon visiting HenHouse Sugaring Company in Edgecomb, Maine. They learned how to make maple syrup and then we sampled maple syrup over ice cream. SCS Holiday Concert under the direction of music teacher, Jen McIvor was a huge success last night at the Southport Town Hall. It was a packed house of family and friends. It ended with the children joining their families and singing Christmas songs all together.Happy Holidays Everyone! What a wonderful celebration we had at school today, honoring Southport veterans and their family members! We want to thank Ron Orchard as well as Bob Eaton for sharing some of their experiences. We showed our appreciation for their service by making and serving them breakfast, singing and sharing pieces of writing with them. Nikki Tibbetts K/1 class has began its 3rd year with Forest Friday's under the direction of Tracey Hall from Boothbay Region Land Trust. Students carve pumpkins from the garden that Aric Pickens made for the students of Southport School! Kay McLeod Plays Rachel Carson Bingo with the children. 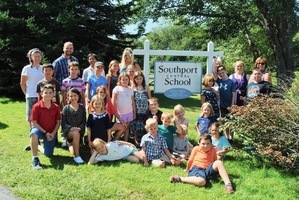 Nikki Tibbetts has joined Southport School staff as the new K/1 teacher.